I have 28000 kms on my RWB VFR 800. Its been 2 great years of riding. I'm riding much more than I thought I would about 5000kms a year. Mechanical engine issues are rare, even at higher miles. Electrical upgrades, and wear items such as clutch and cam chain tensioners are all that need to be addressed. It's just maintenance at that point. As per my avatar, did 102k km's on mine when an oncoming car did a left turn in front of me. I'm convinced redslut would have done double kilometrage that if this had not happend. 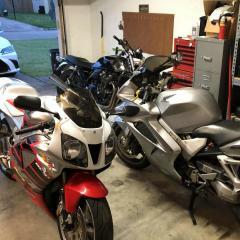 For perspective, here are the things I've had to do for my 6th gen VFR (and its only average for mileage) beyond chains, brake pads, and fluids. * Front brake rotors, steering head bearings, fuel pressure regulator, and cleaned fuel injectors at 60,000 miles (96k km). * Front wheel bearings at 68,000 miles (109k km). * Stator and r/r at 70,000 miles (112k km). * Cam chain tensioner at 80,000 miles (128k km). You're good for a bit. I have 77,800 miles on my 4th gen, equal to about 125,000 kilometers. Still runs like a champ. Checked my valves at 61,000 and all were in spec, but 2 were just in the allowable parameters, so Ill have a look this winter. Gear driven, so no tensioner issues. I'll also do a full fork rebuild, new bearings for the rim and head stock, a few other bits also. Realizing I was racking up the miles fairly quickly, I bought a low mileage (28,000) 3rd gen this past summer as my backup plan. I had a 3rd gen when I was working in England a couple of years ago and really liked that bike. Carbureted, gear driven cams, 8 spoke rear that fits a 180, it ticked all the boxes. 162,000ks on my 5th gen. I bought it with 150,000, and turned it into a fighter. Just changing the water pump now, changed the reg rec, apart from that, all good. 118k miles (190k km) on a '99. Not my daily rider any more but still 2-3x per month, still fires right up. Had it since basically new. Wouldn't hesitate to jump on it right now for a week-long ride. I'm at 62,000 miles, or 99,200 kilometers. I've replaced components of the charging system (RR and stator), but everything else has been normal wear or "necessary" upgrades (seat, risers, pegs, voltmeter, STS auto signal, switchable circuit panel, and USB outlet). Do the maintenance, keep it clean, and you can enjoy it for a lot of years. Did you ever do a posting/photos on how you converted your 5th gen to a streetfighter. I would be very interested in knowing the changes that you made, particularly with regard to the side mounted radiators. sebs is a lot prettier, but well, he is really, really talented. Link to my incredibly long running thread over the years. I still love it. The TLR rad works brilliantly, but is probably harder work than the vfr750 rad to mount. However, it works so well i may ditch the oil cooler. (or change to a water/oil cooler). I also know of someone who is running a vfr400 set of front mount rads on his fighter. The VFR has one of the best made bike engines in the world. As the RC45 It was designed to handle up to 200bhp. When reworked into the 5th gen it’s basically the same engine. When reworked for a second time into the 6th gen & now 8th gen, it’s a similar engine. The basics like beatings etc are the same. The switch to cam chain drive was less than successful by comparison. But fine if the tensioner are maintained. So as it stands producing less than half the HP it was designed for, its greatly under stressed, so lasts a long time with just basic maintenance. Other areas to consider are are the wheel bearings & wearing parts of the running gear, head bearings, seals etc. They require replacement periodically. But other than that if you look after these bikes they will run for a long long time. Ride it, look after it & enjoy it. Have fun. Castrol had a bench-test engine which had over 1/2 a million miles on it. Sure, it was a bit like Trigger's broom (the Brits will understand that reference), with replacement clutches and gearboxes along the way but original bottom & top end and there is at least one road-going VFR800 over here I've seen with 400,000 mile+. As Mohawk says, ride it, look after it & enjoy it. It's a Honda! Seb, that has has got to be one of the most detailed threads on this forum, and the images paint a thousand words. Thanks for taking the time to do it. Keef, I think that your bike looks great. Beauty is in the eye of the beholder!